There is no doubt that insects are an important part of the world’s eco system, so we should probably not simply try to kill them all off. This does not mean that you should find yourself pinned to the chair because a family of spiders is standing in the middle of the floor. It also does not mean that you should have to throw out a ton of food items because ants have found their way into your kitchen cupboards. 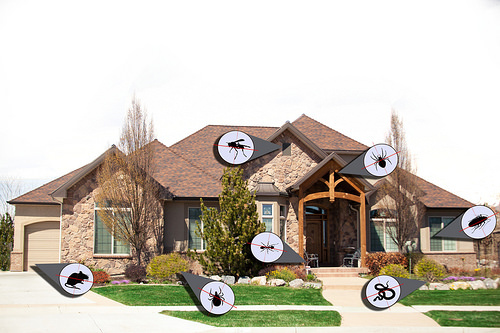 You want to make sure that insects stay outside of your home. Doing this successfully, involves using pest control. But what about the problem of using chemicals? We have already mentioned how killing all insects is bad for the ecosystem; you may be concerned about pest control chemicals, for the same reason. Many pest control experts actually offer services that are more environmentally friendly than was previously the case; you can find out more about eco-friendly pest control service. If you would rather try your own eco-friendly methods first, here are a few ideas. Diatomaceous earth is simply a collection of fossilized remains of a species of algae. The remains consist of hard and sharp pieces which are microscopic in size. These pieces damage the exoskeletons of the insects that may be tempted to invade your property, killing them. You only need a thin layer of diatomaceous earth to do the job and you can sprinkle it wherever you choose, as it’s perfectly safe. Mint is harmless to humans, but ants and flies do not like it. All you should do is scatter a few leaves around where there is a potential problem of infestation, and the culprits should be deterred. As an added bonus, mint gives your home a fresh and clean scent. This may sound like a really simple solution; but it can work. You just need to fill a spray bottle with a soap flakes and water solution, then point at the bugs you want to get rid of, and spray. The soap in the mixture damages the exoskeleton of the bug. The water then gets inside and the bug drowns. It’s as simple as that. Termites that invade from underground can be deterred by using a barrier of sand. They cannot tunnel through the sand in the same way that they can tunnel through earth. You can use sand around the foundations of your property, in crawl spaces and in any other area that may be susceptible to termite activity. This may sound a little gross, but you can actually kill termites using a different type of creature; microscopic worms called nematodes. They are just pumped into areas where there is a problem with termites and they then kill any termites which are present. You can use any or all of these solutions to try and rid your home of a pest problem. If you have any issues doing so, do not be worried about calling in the experts. You can discuss any concerns about chemicals with them, before any treatment is started.